With 23 completed, I could look at it with my glass half empty and think 27 left; not achievable. Instead, my positive head is on, and I am looking at the 9 ongoing activities. A few of these are having to be almost treated as work (the rare enjoyable type) and certainly in the last few weeks, I have worked hard on one in particular and hope to complete by end of April. Putting that date down gives me an aim. The challenge is number 29, start and complete a sewing project. 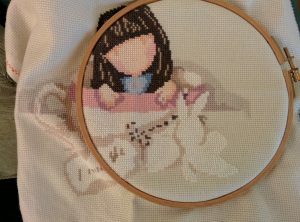 I am not the fastest of cross stitchers; I just plod along at my own pace. Something I do with most of things in my life! I am also not known for finishing the projects. 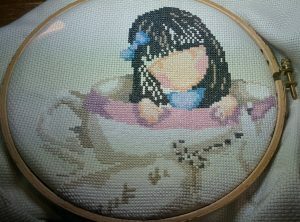 Having this as a challenge has made me want to finish it and it has also made me realise how much I enjoy stitching and when I have finished, I have my next one waiting to do. A great big hint to the kids; well a link to the site where they could buy the kit from and I had a happy mother’s day! 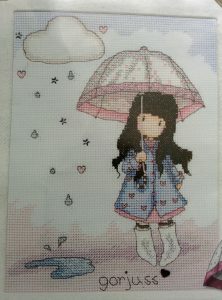 I wanted this one because of the umbrella. I will not open until I have finished my first cutie. 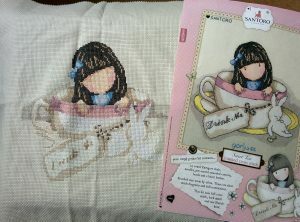 I am at the moment trying to stitch every night but have made Tuesdays my big stitching day. I normally share a picture with Kathryn as the evening comes to an end. Last week was very exciting as I had finished the face. Yesterday, I did wonder if the end of the April is realistic (small voice is whispering you have got until 6 June). There is still a lot to do but I’m sure if I put my mind to it, this girl can! Today’s start – end of April!! As previously mentioned, I do actually get to watch a bit more television now. Last week I enjoyed watching Drew Barrymore in Miss You Already and last night’s film was Mother’s Day. I’ve caught up with Broadchurch, Mary Berry and this week’s film was Flashdance – I knew every scene! Definitely a great hobby that I am going to look forward to continuing once my challenges are all ticked. Certainly working hard for my ticks. Runnin, runnin, runnin, ain’t running by myself no more! Kathryn Terry on What’s in the Box, the Cardboard Box?